I discovered June Kearns’ books through the lovely Rosie Amber’s blog when I reviewed ‘The 20’s Girl, the Ghost and All That Jazz’ (see my review here). 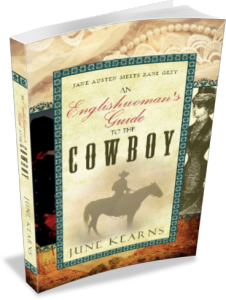 I enjoyed it so much that I had to read ‘An Englishwoman’s Guide to the Cowboy’. Hope you enjoy my review and the extract from the book that follows. You can read my interview with June here. This is a lovely book, thoroughly enjoyable, well written and with a cast of characters that you’ll love and hate!